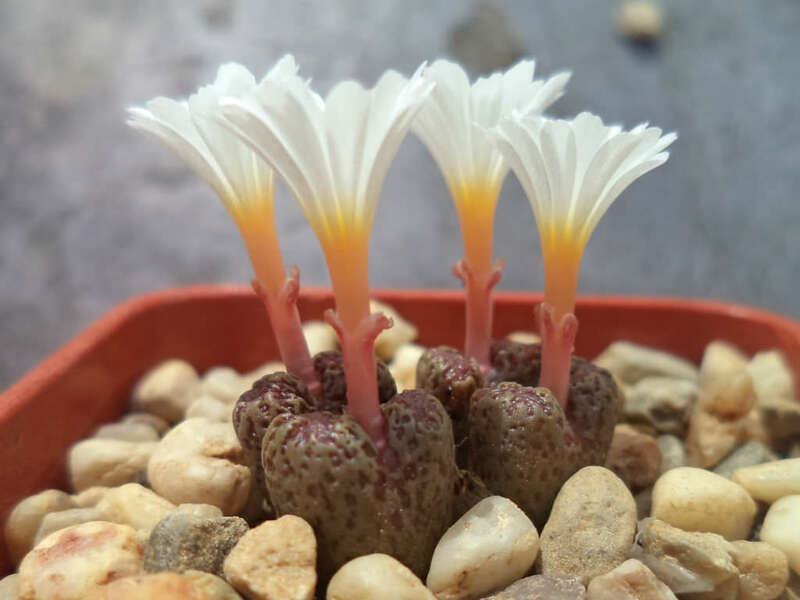 Conophytum pellucidum is a tiny densely branched perennial succulent. The paired leaves are up to 0.8 inch (2 cm) tall and up to 0.5 inch (1.2 cm) in diameter, apex of the pair fused, not lobed, upper surface with grey-green to coppery-brown island and intricate markings which consist of pale grey to brown branched windows sometimes fleetingly blood-red. The flowers are white and appears in mid to late summer or autumn. 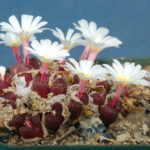 Conophytums are usually grown in dish gardens where they spread slowly but make good ornamental plants for window gardening. They also do well in rockeries where they can be grown in crevices. 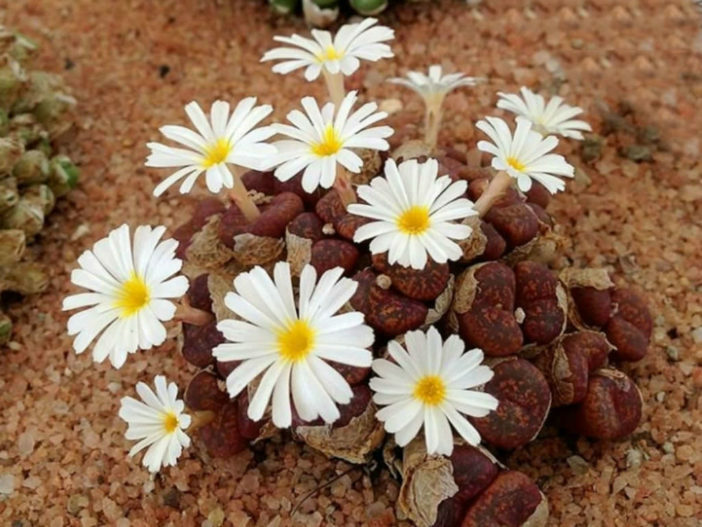 The Conophytum vegetate during the winter season. They must then be kept dry during hot, gradually wet upon autumn arrival: the moisture stimulate the release of new root hairs and the plant will grow for the entire winter season, foliar issuing new pairs from inside the existing ones. Flowering usually occurs in autumn and the color of the flowers is extremely variable from species to species. The cultivation is quite easy, but care must be taken to avoid excess water and to prevent rot: the plants themselves communicate their water needing with a slight wrinkling of the epidermis. 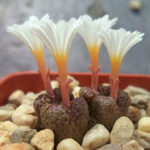 They do not particularly fear the cold weather and can resist also at temperatures of 23°F (-5°C), as long as the soil is completely dry and the temperature returns rapidly to rise…. 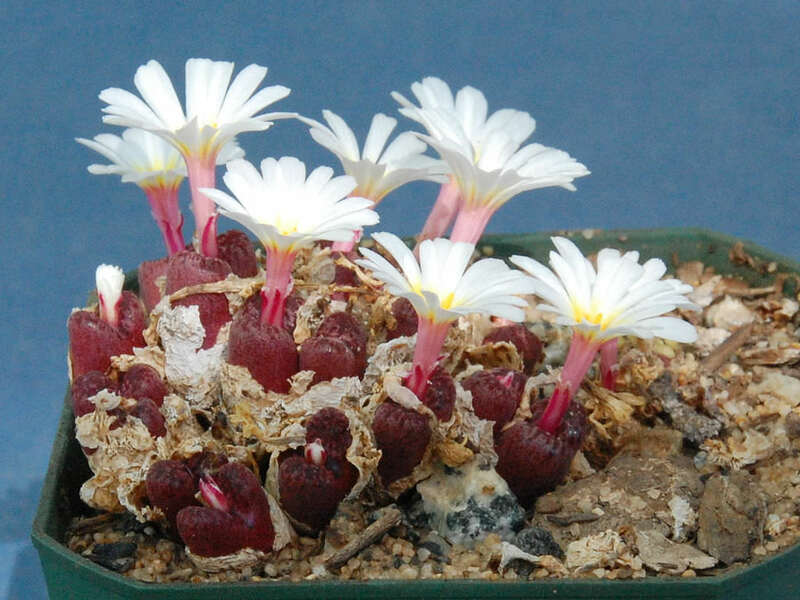 – See more at: How to Grow and Care for Conophytum. Native to South Africa (Namaqualand, Bushmanland, Northern Cape).